The Irish Pub, 2007 Walnut St. There are tons of ways to celebrate St. Patrick's Day 2018. Want to drink green beer all day? No problem. Want to party with your family at a parade? That works, too. Whether you plan on celebrating Saturday, March 17, or want to start the festivities early, use our guide below to discover what's happening for the holiday. Drink Philly is throwing an early St. Patrick's Day party featuring Teeling Whiskey, at the historic Mask and Wig Club in Center City. The event's vibe will be 1920s speakeasy. All attendees are encouraged to dress like they're on set of the Netflix hit "Peaky Blinders." Tickets are $50 per person and include all drinks during the three-hour party. Get into the St. Patrick's Day spirit while also fitting in a workout. A week before the holiday, the Leprechaun Run will take place in Philly. The annual event, now in its 33rd year, benefits Special Olympics Pennsylvania. Celebrate St. Patrick's Day by joining in this epic bar crawl. It's free to attend, plus free shuttles will drop you and your friends off at the participating bars. This year, the Erin Express "warm up" will take place Saturday, March 10, and the official Erin Express will take place on Saturday, March 17. The annual St. Patrick’s Day Parade in Conshohocken will take place on Saturday, March 10. The parade will take place on Fayette Street, starting at 11th Street at 2 p.m.
Pubs and restaurants along the parade route will throw parties and offer specials before, during and after the parade. Put on some green gear to race in The Lucky Run in New Jersey. The course winds through a scenic park, where bagpipes will play for runners. Post-race, there will be a party at a local bar. All participants 21-plus will get a Guinness to cheers in celebration. The Philadelphia St. Patrick's Day Parade has been a tradition since 1771, making it one of the oldest parades in the country. This year, the parade will take place Sunday, March 11. Crowds can expect to see Irish dancers, marching bands, Irish musical groups and decorated floats. Art in the Age in Old City will host a release party for Brothership Blended Whiskey, a blend of Irish and American whiskies, on Thursday, March 15. During happy hour there will be cocktails highlighting the collaborative spirit. Brothership is the product of a partnership between Connacht Whiskey Company Ltd. in Ireland and New Liberty Distillery in Philadelphia. It will be sold on both sides of the Atlantic. Learn about the Irish buried at the historic cemetery, then enjoy beer and food. The tour will take place on St. Patrick's Day at 1 p.m. The Irish pub will open early on Saturday, March 17, for its annual St. Patrick's Day party. Beginning at 7 a.m., the drinking-age crowd can down Guinness and whiskey to celebrate the holiday. There will be live music at the pub, too. 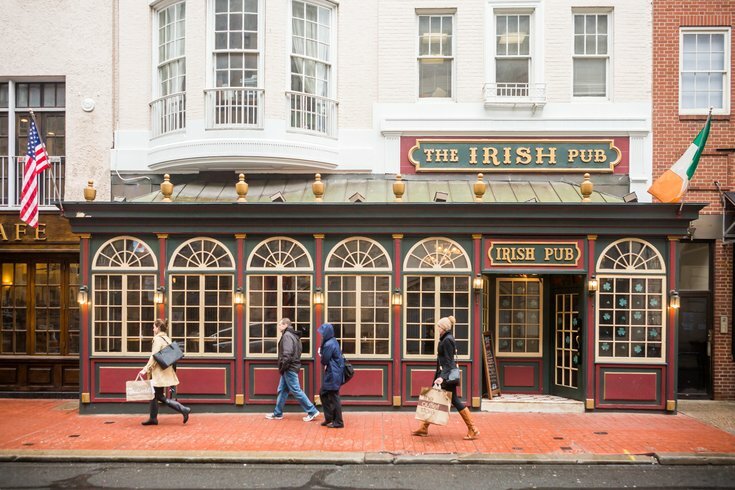 The Irish Pub will throw St. Patrick's Day parties at both of its Philadelphia locations. There will be Irish music, bagpipes, Irish dancers, giveaways and, of course, plenty of beer. St. Paddy's Day at Xfinity Live! Celebrate St. Patrick's Day at Xfinity Live! on Saturday, March 17. There will be live performances in Victory Beer Hall, a cash confetti celebration and green beer. If you have a designated driver, they can park for free after 8:30 p.m. The Irish pub will open an hour early on St. Patrick's Day, serving green beer all day long. Leading up to the holiday, McGillin's will serve a rotating list of Irish foods, like corned beef with cabbage or lamb stew. Field House will throw an indoor/outdoor party on Saturday, March 17, beginning at 11 a.m. There will be live music, food and Stateside Vodka drink specials. VIPs will also get $2 Miller Lites from 11 a.m. to 1 p.m.
St. Stephen's Green is throwing a family-friendly, pet-friendly block party to celebrate the holiday. Kids can play with bubbles and get their face painted, while adults enjoy $3 Miller Lite and beer pong. To entertain everyone, there will be Irish dancers and a performance by The Bare Knuckle Boxers. With The Shamrock Crawl wristband, there's no cover charge at participating locations. Plus, bar crawl participants can enjoy drink specials from noon to 6 p.m. This bar crawl will take place in Rittenhouse and Old City. At the participating pubs there will be free admission and drink specials. Registration is at Fox & Hound. After checking in, you can visit any of the other venues in any order that you want. Vesper Sporting Club will shut down Sydenham Street to celebrate St. Patrick's Day. The party starts at 2 p.m. with a live band and DJ and continues into the night inside of Vesper. There will be drinks specials, games, giveaways, whiskey, beer and food. If you want to start the party early, you can stop by Vesper for bottomless brunch from noon to 4 p.m. Bottomless mimosas are $25.